Physician Anesthesiologists are easily the most underappreciated providers in the perioperative process. To begin with, they are the only physicians to care for the patient throughout her pre-, intra-, and post-operative phases. Each phase requires a seamless gear-shift while managing a different set of priorities and new decision trees. The anesthesiologist then drives that same vehicle between the ICU & the OR, pediatrics & geriatrics, and all across the APGAR and ASA score spectrums. The wealth of knowledge and depth of skills these tasks require leads authors to question whether physician anesthesiologists are, indeed, the last real generalists. And even if the patient does know who they’re dealing with and what they do, which patients will actually remember their anesthesiologist? After all, the best anesthesia is the kind that you don’t remember. Hi! I’m an anesthesiologist. You may remember me from… let’s be real, you don’t remember me because I give you forget-me-drugs. I am pleasantly forgettable. The anesthesiologist’s primary goal is to keep the patient unaware –- unaware of the pain and of as much as the surgical experience as possible. Even if they wanted to write a note of thanks…who would the address it to? Anesthesiologists are also leading the charge on the front lines of the battle with the Opioid Crisis. Addiction to opioids in the aftermath of managing severe and chronic pain has swept the nation. The anesthesiologist—the specialist in pain management—is the expert to turn to who can offer valid alternatives to opioids. Such alternatives as non-opioid medications, physical therapy, acupuncture, surgery, and injections or nerve blocks can make all of the difference in the world without the associated risk of addiction. There are even multiple high-tech methods now available to help counteract chronic pain, and guess where you can find education? At the American Society of Anesthesiologists website. And so, as this is Physician Anesthesiologist Week (#PhysAnesWk19), Graphium Health is so glad to celebrate such a skilled, knowledgeable, and passionate group of providers. You all do so much for healthcare that goes unrecognized, and this week is well deserved. Thank you for all that you do, and keep up the good work! 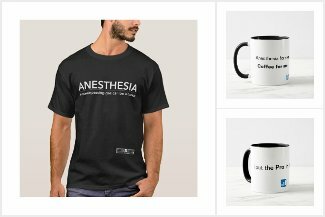 Swag designed JUST for Anesthesiologists. As a thank you to the Anesthesia community, we’ve added a few pieces that are just for you. Your hard work and dedication deserves so much recognition.